Alfonso Jones is killed in this book. His death happens on page two, so it's hardly a spoiler. The rest of the book then relays who he was and what he meant to those who knew him, initially through flashbacks but then also through commentary Jones himself makes as a ghost. Jones, it turns out, was a bright and talented fifteen year old. He worked hard, both at school and as his job as a bicycle messenger. He was in the school play. His father was about to be released from prison after DNA evidence finally proved his innocence. Things were going well. Until a random and unnecessary act of violence from a police officer. The story is original, but it feels far too well-trod. Not because other writers have written the same thing, but because we hear about this on the news day after day after day. An unarmed Black person is killed; the cop swears he was justified despite all the evidence to the contrary; there are marches and rallies and tears, and callous attacks of character against the victim; the cop walks away with barely even a slap on the wrist; the victim's friends and family can do nothing but mourn and shout into the void in the hopes that someone will hear. If you haven't heard this story at least a dozen times, you've been actively not paying attention. The most fictitious element of this story is on page 148, where we see that the President is a Black woman. Which is not to say that this isn't powerful story. We get a lot of insights into who Jones is that frequently get left out of mainstream news reports. Particularly the impact he has/had on his classmates. There's plenty here to have readers connect and empathize with Jones. So it's no longer that lone, unflattering picture that the media often uses for Black victims of police violence, but a fully realized and rounded-out character. He's a boy with hopes and dreams. Some longer term than others, some more realistic than others. But he quickly becomes a boy readers care about, and one they're saddened to see go -- even though he dies almost as soon as he's introduced to them. And lest anyone be concerned that this story is "clearly" a social justice warrior book meant to stoke hatred against the police or something, the officer in question is given a sympathetic story as well. As the title suggests, the story is definitely Jones' but the cop is not portrayed as some Black-hating Klansman either. He's not just a simple straw-man argument or generic boogeyman, but he's got his own worries and fears as well. Ultimately we don't learn what exactly was going through the character's mind when he shot Jones, but Jones himself feels conflicted about his killer from what he does see. I was surprised at the effectiveness of the story structure. For as much as they jump around in time, between flashbacks to memories to stories the dead tell each other to the "main" story, it holds together very well. As a reader, I was never at a loss for when I was supposed to be relative to Jones' life (or afterlife). And while I said the story isn't unique, the details are. If you've been paying attention, you'll no doubt catch parallels to actual victims of police violence. "Oh, they said almost the same thing after Tamir Rice got shot." "Oh, that's the same reaction when Philandro Castille was killed." But, as has been pointed out elsewhere, those stories are all presented the same way already. "It looked like he was reaching into his pants for a gun!" "He was no angel!" 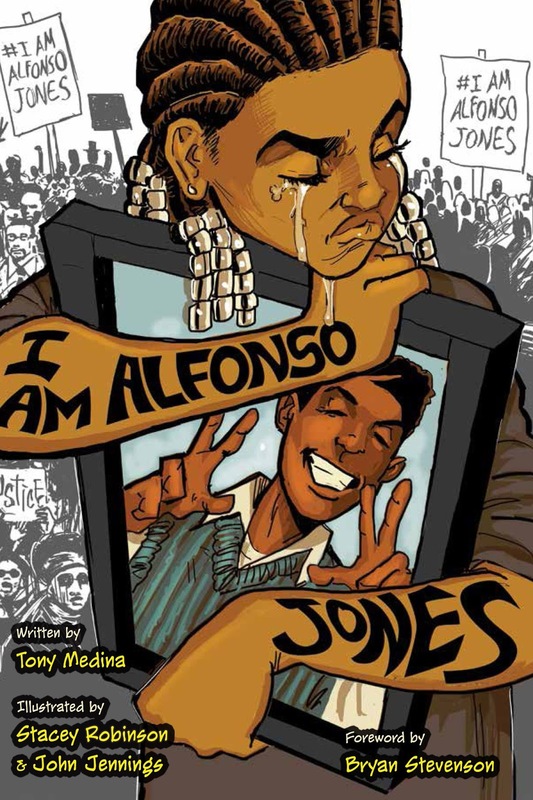 The details in Alfonso Jones are original, even if the overall story, sadly, is not. It was a powerful read. It's not long, but I actually had to set it aside for a bit because things got too powerful. Kudos to Tony Medina, Stacey Robinson, and John Jennings for making sure a moving story out of something we hear so often as to almost become numb to it. Which, I suspect, is a lot of the intention -- to make sure you don't forget that all of these deaths aren't just names and bad photographs, but real people who lived real lives and had a real impact on the world around them. Don't forget their names.